If you keep saying you’ll start your spring cleaning routine tomorrow, it will likely never get done. For best results, stop putting off your organizational goals and start cleaning today. Walking through your home and identifying all the areas that need organization can be intimidating. If you want to ensure the work gets done in a timely fashion, start by making a list of all your tasks. 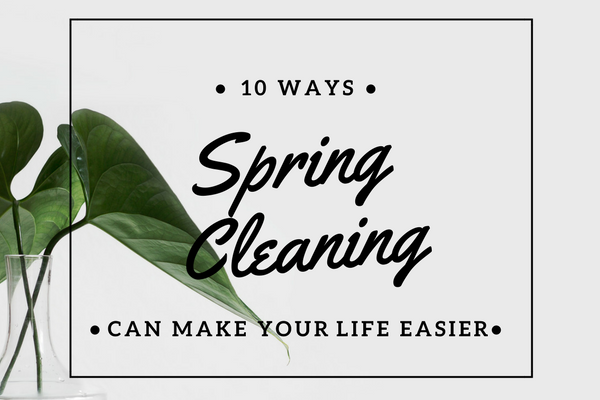 Not only does this make spring cleaning more manageable, but it also enables you to pick up all the necessary supplies in one trip to the stores. When cleaning your house, it’s easy to neglect your dresser drawers. After all, they’re tucked away out of site. However, spring cleaning this space can result in extra room in your closet and other areas. Want to create some extra space in your closet? Start by hanging every article of clothing so it’s facing the same direction. When you wear a piece, turn it around to face the other way. After a couple months, think about tossing, selling, or donating those items that have never been worn. Of course, your closet isn’t the only place where you stow extra items. Give your spring cleaning efforts an upgrade by scouring the house for clutter. For example, you might have a stack of magazines that need recycling, a pile of CDs you don’t listen to, or a drawer of makeup that’s long past its expiration date. Removing these items from the home can declutter both your rooms and your mind. Spring cleaning isn’t just about throwing things away. Sometimes, it’s more important to create new systems of organization. Don’t be afraid to spend money on shelving units, drawer organizers, and other items to keep your home in order. Sometimes, spring cleaning means organizing your life as well as your home. Take a look at your finances as the warmer months approach. You might need to balance your checkbook, review your spending habits, or pick up some folders to organize your receipts. Many people struggle with throwing things away – especially if they’ve owned them for a long time. To ease the process, separate items you’re considering tossing into three boxes: one for trash, one for donating, and one for selling. You’ll feel good about donating gently used items to charity, and you might just earn a few dollars along the way. Spring cleaning can be hard work, both physically and emotionally. Reward yourself for your hard work with a special treat, like a meal out or a trip to a favorite park. Still looking for a way to expedite your spring cleaning? Don’t be afraid to ask for help. At Closet World, our designers have the talent and expertise to design organizational spaces unique to your needs. Contact us today for a free consultation with one of our teammates. In just an hour, we can measure your space, itemize your belongings and present you with an array of ideas for organizing your home and life.